The IC’s authority to conduct intelligence activities is governed by numerous laws and regulations. Of primary importance is Executive Order 12333, United States Intelligence Activities. Most recently amended in 2008, the executive order sets strategic goals and defines roles and responsibilities within the IC, while also affirming the Nation’s commitment to protect Americans’ civil liberties and privacy rights in the conduct of intelligence activities. Executive Order 12333 establishes this balance by prescribing general principles governing intelligence collection, retention and dissemination, and by specifying that intelligence activities concerning U.S. persons may only be conducted in accordance with procedures established by the element or department head and approved by the Attorney General, after consultation with the Director of National Intelligence. Intelligence oversight is a mechanism to ensure that the IC conducts intelligence activities in a manner that that achieves the proper balance between the acquisition of essential information and protection of individual interests. The oversight is performed by entities inside and outside of the IC, which allows the IC to account for the lawfulness of its intelligence activities to the American people, to Congress, to the President and to itself. ODNI engages and coordinates with the following entities in advance of actions where appropriate and provides reports or briefings of intelligence activities to the entities. ODNI has several offices responsible for oversight functions, to include the Office of General Counsel, the IC Inspector General, and the Office of Civil Liberties, Privacy and Transparency. Each of these offices work to ensure that ODNI operates in a manner that promotes IC-wide positive impact that is in accordance with the Constitution and other laws, regulations, executive orders and directives or policies. Each element has similar offices that assist in oversight for the respective element. President's Intelligence Advisory Board (PIAB) -- The PIAB is an element within the Executive Office of the President. The PIAB exists exclusively to provide the President with an independent source of advice on the effectiveness with which the IC is meeting the nation’s intelligence needs and the vigor and insight with which the community plans for the future. The PIAB consists of not more than 16 members selected from distinguished citizens outside the government. The PIAB has access to all information necessary to perform its functions. The Intelligence Oversight Board (IOB) -- The IOB, a standing committee of the PIAB since 1993, consists of not more than four members of the PIAB appointed by the Chairman of the PIAB. The IOB is charged with overseeing the IC’s compliance with the Constitution and all applicable laws, Executive Orders, and Presidential Directives. Privacy & Civil Liberties Oversight Board (PCLOB) -- The PCLOB is an independent agency established by the Implementing Recommendations of the 9/11 Commission Act, Pub. L. 110-53, signed into law in August 2007. Composed of four part-time members and a full-time chairman, the Board's responsibilities comprise two basic functions: oversight and advice. In its oversight role, the Board is authorized to continually review the implementation of executive branch policies, procedures, regulations, and information sharing practices relating to efforts to protect the nation from terrorism, in order to ensure that privacy and civil liberties are protected and to determine whether they are consistent with governing laws, regulations, and policies regarding privacy and civil liberties. In its advice role, the Board is authorized to review proposed legislation, regulations, and policies (as well as the implementation of new and existing policies and legal authorities), in order to advise the President and executive branch agencies on ensuring that privacy and civil liberties are appropriately considered in their development and implementation. The Board is also directed by statute to, when appropriate, coordinate the activities of federal agency privacy and civil liberties officers on relevant interagency matters. Office of Management and Budget (OMB) -- OMB is part of the Executive Office of the President. OMB carries out its mission through five critical processes that are essential to the President’s ability to plan and implement his priorities across the Executive Branch: (1) Budget development and execution; (2) Management, including oversight of agency performance, human capital, Federal procurement, financial management, and information technology; (3) Regulatory policy, including coordination and review of all significant Federal regulations by executive agencies (4) Legislative clearance and coordination; (5) Executive Orders and Presidential Memoranda. Pursuant to Section 502 of the National Security Act of 1947, which states that the heads of the IC agencies shall “keep congressional intelligence committees fully and currently information of all intelligence activities of the United States,” ODNI ensures that congressional committees are apprised of the activities of the IC, by providing notice of any significant anticipated intelligence activities and notice of potential intelligence failures. The Office of Legislative Affairs (OLA) is the principal interface between the ODNI and the Congress. In addition to providing support and legislative strategy to the ODNI senior leadership, OLA serves as a focal point within the Intelligence Community Legislative Affairs cadre for legislative views, which are provided to the Office of Management and Budget as part of its interagency coordination process. OLA serves as a focal point for the Intelligence Community for the production of the Annual Threat Assessment provided to Congress each year. The Director of National Intelligence traditionally serves as the principal witness, although other IC agencies senior representatives join the witness table. These hearings usually involve open and/or closed sessions before separate intelligence oversight and national security committees; open hearings often are televised. The National Intelligence Council works closely with OLA to coordinate the preparation and execution of these hearings. In addition, the President’s annual budget request for the National Intelligence Program normally results in additional closed hearings. The Office of the Assistant Director of National Intelligence – Chief Financial Officer works closely with OLA to coordinate the preparation and execution of these hearings. The Foreign Intelligence Surveillance Court was established in 1978 when Congress enacted the Foreign Intelligence Surveillance Act (FISA). The Court sits in Washington D.C., and is composed of eleven federal district court judges who are designated by the Chief Justice of the United States. Each judge serves for a maximum of seven years. By statute, the judges must be drawn from at least seven of the United States judicial circuits, and three of the judges must reside within 20 miles of the District of Columbia. Additionally, the FISC assesses sufficiency of IC foreign intelligence procedures and receives compliance reports from the IC concerning violations of FISA. The Information Sharing Environment (ISE) was established by the Intelligence Reform and Terrorism Prevention Act of 2004 (IRTPA). Section 1016 of IRTPA embraced the key principles of Executive Order 13356, Strengthening the Sharing of Terrorism Information to Protect Americans, and directed the establishment of the ISE “for sharing terrorism information among all appropriate Federal, State, local, and tribal entities, and the private sector." The President was charged with creating the ISE, designating its organization and management structure, and determining and enforcing the policies and rules to govern the ISE’s content and usage. The ISE provides analysts, operators and investigators with information needed to enhance national security. These individuals come from a variety of communities—law enforcement, public safety, homeland security, intelligence, defense, and foreign affairs—and may work for federal, state, local, tribal, or territorial governments. They also have mission needs to collaborate and share information with each other and with private sector partners and our foreign allies. As ISE participants, federal agencies and state, local, tribal, and private sector partners deliver, and operate, the ISE and are responsible for sharing to enable end-to-end mission processes that support counterterrorism. These partnerships are furthered through In-STeP 1-on-1 Meetings. These meetings provide the opportunity to present S&T projects to IC stakeholders. More than 50 meetings have been scheduled since the spring of 2015. The In-STeP Brochure below contains more information about the In-STeP 1-on-1 Meetings and how you can get involved. Stimulating cutting-edge public- and private-sector research is critical to ensuring strategic and tactical intelligence advantage for our nation’s policymakers and warfighters. Building upon the new science opportunities identified by the ODNI’s Intelligence Science & Technology Partnership (In-STeP) technology roadmaps, In-VEST is intended to provide the private sector with early signals for the types of advanced technology that the IC is anticipated to require, providing industry and academia an opportunity to invest appropriately now to support the IC’s future needs. In parallel, In-VEST will leverage and influence U.S. Government-wide research to help meet these same challenges. The In-VEST program is designed to be the catalyst for accelerating R&D activities to meet select In-STeP-identified challenges. Using complementary requests for information (RFIs) and prize challenge competitions, In-VEST seeks to stimulate private-sector investments and leverage—or at a minimum, influence—current initiatives relevant to these challenges. For more detailed information, our In-VEST brochure is available here. The Intelligence Advanced Research Projects Activity invests in high-risk/high-payoff research to provide the U.S. with an overwhelming intelligence advantage. As the only research organization within the ODNI, IARPA works with the other 16 IC elements to address the IC’s most challenging problems that can be solved with science and technology. IARPA performs no research in-house; rather, it funds researchers in colleges, universities, companies, National Labs, and other organizations, in fields as diverse as artificial intelligence, asset validation and identity intelligence, bio-security, chemical detection, cyber security, high performance computing, human judgment, linguistics, radio frequency geolocation, and secure manufacturing of microelectronics. In addition to using traditional contracts and grants, IARPA uses public challenges to award cash prizes to researchers for innovative solutions that achieve specific goals. To date, IARPA has funded over 500 unique organizations (academia, small businesses, large businesses and non-profits). Over 1,500 unique bidders have been part of research proposals and abstracts submitted to IARPA. Every four years since 1997, the National Intelligence Council has published its Global Trends report, an unclassified strategic assessment of how key trends and uncertainties might shape the world over the next 20 years to help senior US leaders think and plan for the longer term. The report is timed to be especially relevant for the administration of a newly elected U.S. President, but Global Trends increasingly has served to foster discussions about the future with people around the world. These global consultations, both in preparing the paper and sharing the results, help the NIC and broader U.S. Government learn from perspectives beyond the United States and are useful in sparkling discussions about key assumptions, priorities, and choices. Since 1979, the NIC has served a bridge between the intelligence and policy communities, as well as a facilitator for outreach to outside experts. The NIC's National Intelligence Officers, drawn from government, academia and the private sector, are the IC's senior substantive experts on a range of issues and work under the auspices of the ODNI. The NIC covers the regions of the world as well as functional topics, such as economics, security, technology, cyber, terrorism, and the environment. The NIC coordinates Intelligence Community support for U.S. policy deliberations while producing papers and formal National Intelligence Estimates (NIEs) on critical national security questions. The Intelligence Community’s role is to provide timely, insightful, objective, and relevant intelligence to inform decisions on national security issues and events; the IC does not make policy recommendations. The IC collects, analyzes, and disseminates information concerning intelligence activities directed against the United States by foreign powers, organizations, persons, and their agents; conducts actions to protect against such hostile activities; conducts covert action and special activities; and performs other such intelligence activities as the President may direct. Analytic objectivity and sound intelligence tradecraft ensure our nation’s leaders receive unbiased and accurate intelligence to inform their decisions. ODNI has further codified these standards in Intelligence Community Directive (ICD) 203, Analytic Standards. The IC Analytic Standards were established in 2007, and revised, revalidated, and approved by the DNI in January 2015. These analytics standards govern the production and evaluation of analytic products, articulate the responsbility of intelligence analysts to strive for excellence, integrity and rigor in their analytic thinking and work practices. ICD 203 serves as a common foundation for developing education and training in analytic skills. The Directive articulates five Analytic tradecraft Standards, which demand that our work be: objective, independent of political considerations, timely and based on all available sources. IC 203 further states that all IC products must "implement and exhibit" nine Analytic Tradecraft Standards. IRTPA tasked the ODNI with identifying an individual (Ombudsman) to assist analysts throughout the IC to respond to real or perceived problems of analytic tradecraft, politicization, biased reporting, or lack of objectivity in intelligence analysis.ICD 203 directs the heads of IC elements to designate a similar individual or office to respond to concerns raised by the element’s analysts about adherence to analytic standards. IRTPA also requires that IC elements conduct internal programs of review and evaluation of analytic intelligence products using the IC Analytic Standards as the core criteria, and provide annual status reporting to ODNI. Conducting hundreds of interviews annually among senior IC customers. ODNI is required by law to report the results of these efforts annually to Congress. Intelligence Community senior leaders believe strongly that diversity is a mission-critical imperative, essential to ensuring our Nation's security and success in the war on terror. The IC is united in protecting and preserving national security. This could not be accomplished without a talented workforce that embraces "Diversity" as a core values of its Principles of Professional Ethics for the Intelligence Community. To combat emergent global, and increasingly complex national security threats, the IC must employ, develop, and retain a dynamic, agile workforce that reflects diversity in its broadest context: cultural backgrounds, ethnicity, race, gender, age, disability, gender identify, heritage, language proficiency, and perspectives. To that end, in early 2006, the Director of National Intelligence appointed the first Chief of Equal Employment Opportunity (EEO) for the IC and made the decision soon thereafter to merge this office with the IC Diversity Strategies Division (formerly in the IC Chief Human Capital Office) to better integrate EEO and diversity functions and leverage resources. This Office of IC EEO and Diversity (EEOD) reports directly to the DNI. In addition to its IC-wide responsibilities, IC EEOD also provides these services for the ODNI workforce and organization. In July 2005, the DNI issued his first DNI's Policy Statement on Diversity to the IC. In 2015, ODNI launched the IC Equal Employment Opportunity and Diversity Enterprise Strategy, 2015-2020, which sets the strategic direction for numerous ongoing efforts across the community. Now, senior executives are held accountable through performance plan objectives that require they describe how they are creating a more inclusive organizational culture. All senior executives must also complete unconscious bias training. In June 2016, the ODNI released its first public report on Intelligence Community workforce demographics, the latest in a series of steps shedding light on the IC’s struggle to recruit talented officers who mirror the diverse country they serve. 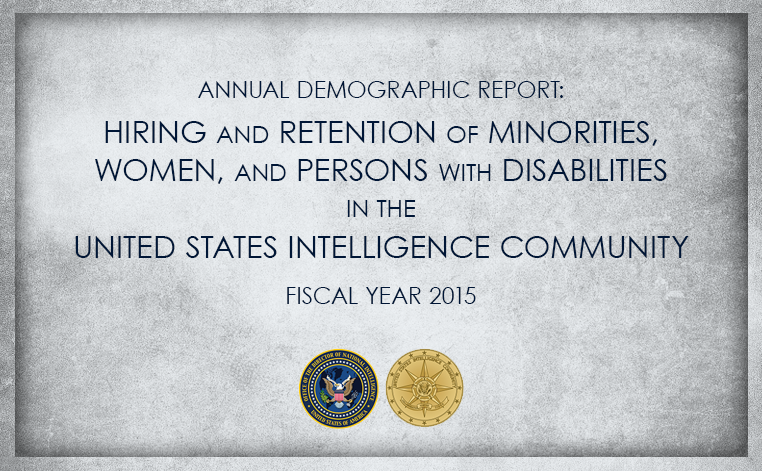 The report, the Annual Demographic Report: Hiring and Retention of Minorities, Women, and Persons with Disabilities in the United States Intelligence Community Fiscal Year 2015, provides an in-depth examination of IC diversity as of Sept. 30, 2015. The report is required by Congress and has been provided to oversight bodies annually since 2005 but had never been publicly released. The report highlights key initiatives and accomplishments and tracks the IC's progress and areas for improvement in diversity hiring, promotion, career development, and attrition. Overall, the FY 2015 analysis indicates that the IC continues to make progress in increasing the representation of minorities, women, and persons with disabilities. In Jauary 2017, the IC Equal Employment Opportunity and Diversity Office released Diversity and Inclusion: Examining Workforce Concerns within the Intelligence Community. This report provides an in-depth examination of barriers pertaining to hiring, retention, and career development of women, minorities, and persons with disabilities in the IC. This report builds upon extensive prior data analysis and reporting conducted annually across the IC and examines underrepresented groups’ concerns in the workplace through the lens of an extensive literature review, with the goal of determining why these issues continue to exist despite numerous attempts to break them down. The result is a first-of-its-kind effort to look at diversity and inclusion across the entire IC as an integrated entity, which highlights six major areas where the IC can take an integrated approach to reduce or eliminate workplace challenges to hiring and retaining a more diverse workforce. Provide a workplace free of discrimination, harassment, and the fear of reprisal, where all are treated with dignity and respect and afforded equal opportunity to contribute to their full potential. The IC will continue to attract, develop, engage, and retain a workforce that possesses both the capabilities necessary to address current and evolving threats and a strong sense of integrity. Special emphasis is needed to recruit, retain, develop, and motivate employees with skills fundamental to the success of the intelligence mission, including foreign language, science, technology, engineering, and mathematics. The Director of National Intelligence serves as the head of the U.S. Intelligence Community, overseeing and directing the implementation of the National Intelligence Program and acting as the principal advisor to the President, the National Security Council, and the Homeland Security Council for intelligence matters related to national security. The President appoints the DNI with the advice and consent of the Senate. Director of National Intelligence Dan Coats at his first Town Hall with the ODNI Workforce. The DNI works closely with a President-appointed, Senate-confirmed Principal Deputy Director of National Intelligence to effectively integrate all national and homeland security intelligence in defense of the homeland and in support of U.S. national security interests. Ensure that timely and objective national intelligence is provided to the President, the heads of departments and agencies of the executive branch, the Chairman of the Joint Chiefs of Staff and senior military commanders, and the Congress. Develop and ensure the execution of an annual budget for the National Intelligence Program based on budget proposals provided by IC component organizations. Oversee coordination of relationships with the intelligence or security services of foreign governments and international organizations. Develop personnel policies and programs to enhance the capacity for joint operations and to facilitate staffing of community management functions. Oversee the development and implementation of a program management plan for acquisition of major systems, doing so jointly with the Secretary of Defense for DoD programs, that includes cost, schedule, and performance goals and program milestone criteria.